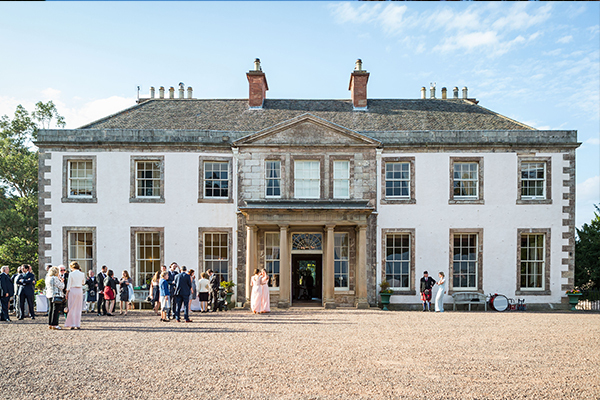 Broxmouth, East Lothian’s wedding venue, provides the perfect Scottish wedding location. With outstanding backdrops for wedding photos, plus resplendent overnight accommodation for up to 24 guests – Broxmouth is a truly magnificent Scottish wedding venue, which will impress you and your guests. Civil wedding ceremonies can be held in the Library or outside in the extensive grounds and groups of up to 60 can be hosted within the main house. Intimate wedding breakfasts can take place in the formal dining room, with marquee receptions for larger parties – all with exclusive access to the house facilities. The aim is to make you feel at home, and the close attention to detail will ensure your wedding is perfect in every way. Broxmouth Park offers a uniquely private and exclusive setting and hosts a limited number of weddings each year. Exemplary service and quality is the aim, to give you the wedding of your dreams, tailored to your desires and your budget. This historic venue can provide luxurious accommodation, sumptuous surroundings and an unparalleled dining experience. Set within a sprawling country estate including 150 acres of beautiful countryside and ancient woodland, Broxmouth offers a special opportunity to celebrate in style. A day which will be cherished for the rest of your lives. There are some glorious backdrops for memorable wedding photos which include the parkland, private wood and tranquil lake with resident swans. For larger weddings of over 50 guests, Broxmouth provides a marquee situated on the lawn in front of the main house. The owners can also recommend some beautiful local churches for your perfect ceremony. After the ceremony, guests can indulge themselves in fine dining and celebrate into the night in the private floodlit marquee whilst enjoying all the first class hospitality provided by this venue. Fine dining, buffets, spit roasts & BBQs, drinks, receptions, table wines & Champagnes, licensed bars – the options are endless. Whatever your needs, whatever your budget, Broxmouth can create a menu just for you.